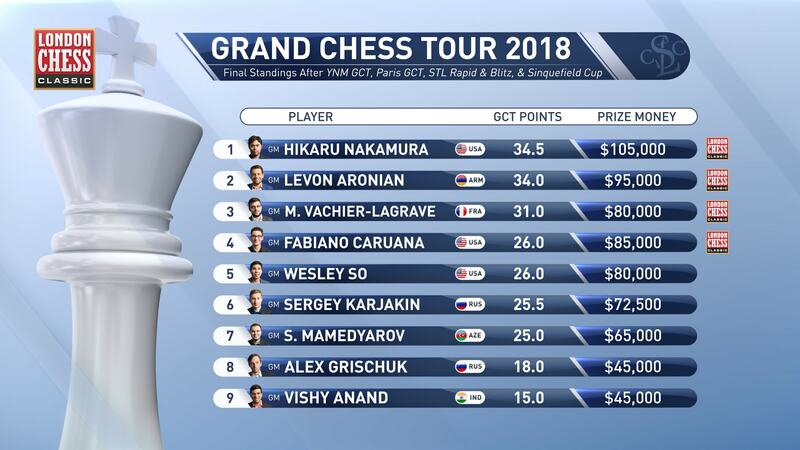 Fabiano Caruana will join Hikaru Nakamura, Levon Aronian and Maxime Vachier-Lagrave in the $300,000 Grand Chess Tour final in London this December after beating Wesley So 1.5:0.5 in the playoff for fourth place. Fabiano described his year so far as, “more than I could ever have expected”, though the one event that really matters is the World Championship match this November. His opponent, Magnus Carlsen, warmed up for that with a little trash-talking at the Sinquefield Cup closing ceremony. I’m incredibly happy, especially with how it all ended, because after Magnus won yesterday for a second I thought I was just out, and then I realised that it was a tie and that was already a huge relief, that I still had the chance to make it. But yesterday was sort of a rollercoaster of emotions, and today as well. 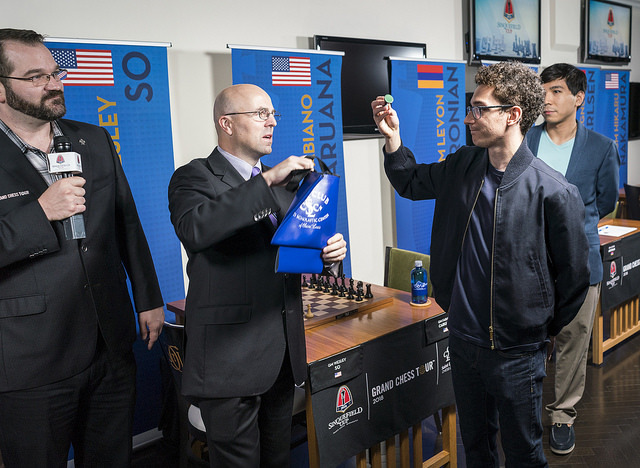 The race to London ended up being incredibly close, with Caruana and So tied on 26 points in 4-5th place, while Sergey Karjakin was just half a point back on 25.5 and Shakhriyar Mamedyarov within a point on 25. 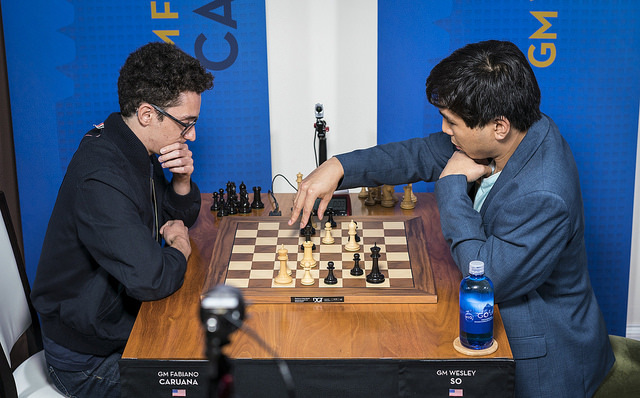 This time there was nothing controversial about a two-player playoff, though, with Caruana and So starting by playing two 25 + 10-second delay rapid games. Pairs of blitz games would have followed, but they weren’t required. The tactically sharp 18…c5! 19.dxc5 Nb4! 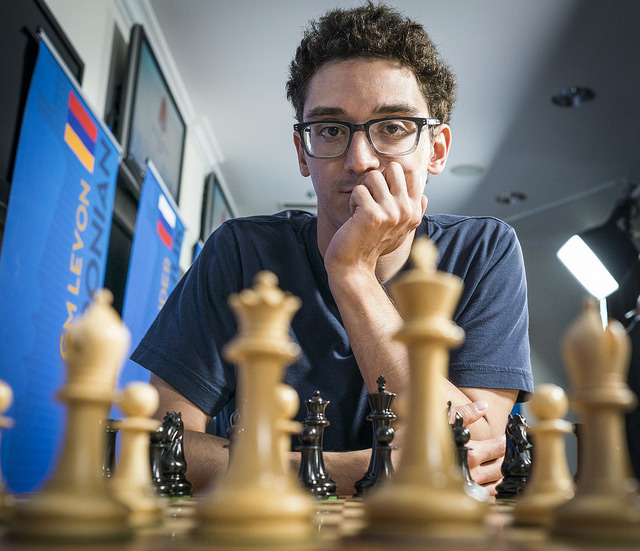 solved most of Caruana’s problems, and a draw was agreed on move 33. Again we got a Catalan, but this time after 24…Bxf2+ 25.Kg1 c5 Wesley So had weakened White’s king position and might hope long-term to exploit his extra pawn. Fabiano sank into deep and later explained that he was trying to make 26.Bf4 or 26.b4 work, but that he was worse everywhere. And then I saw this 26.Ra2! move after maybe 8 minutes of thought, so it was only near the end, and after I saw that I almost immediately played it. It was more like 6 minutes, but it was still a very memorable moment on the live broadcast! 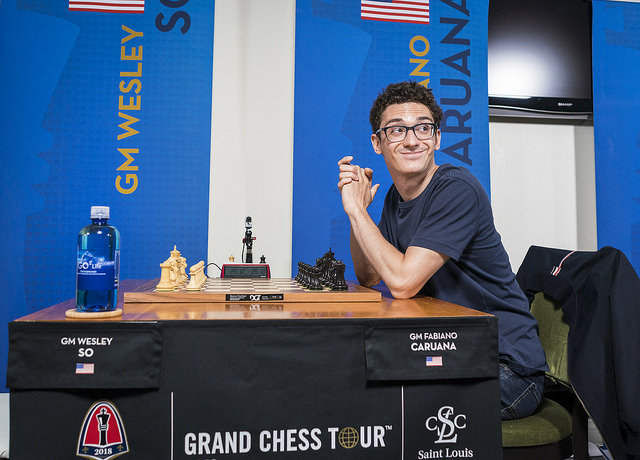 That means that whatever happens in the World Championship match in November in London, Caruana will be back in the city from 11-17 December, when he competes for a $120,000 top prize against Nakamura, Aronian and MVL. I’d like to thank my parents, in the second row, for being here and supporting me! I think it was kind of symbolical to have ten years of this wonderful organisation and support towards our game to have a shared victory, because we all, the players, are so grateful to the Sinquefield family for what they’re doing. We’ve been blessed with everything, just being here. Frankly speaking, I was second three times and wasn’t particularly close to winning any of them, especially that one year with Fabi. I cannot say that I echo Levon’s sentiment that it’s nice to share the victory. It’s much nicer to win on your own, I think! I think Levon would also agree with that. I’ve been telling people all my life that I get nervous, but they never listen, so maybe people will start now! I think it’s part of being really competitive and really caring about the results that nerves are bound to creep in at some point. It’s part of the game, and learning to master it takes a lifetime for most people, so I’m hoping to get there eventually. We had a pretty much identical result in terms of who we beat and who we drew. In our individual encounter I was under very serious pressure, so a draw there was quite good for me. I don’t see what bearing this has on the World Championship match. We both showed that we’ll fight for first place, but this isn’t really a new thing! The Sinquefield Cup may not have told us much new, but it’s certainly reminded us all what a potential classic we have in store for us this November.